In spite of strained relations between the Indian National Lok Dal (INLD) and the BJP, the Gujarat Government has sought the help of the Haryana Chief Minister, Mr Om Prakash Chautala, in opposing the abolition of Central Sales Tax (CST) when value-added tax (VAT) will be introduced in the country from April 1, 2005. The former president and MP of Haryana Pradesh Congress Committee (HPCC), Mr Bhupinder Singh Hooda, has criticised the Haryana Government for failing to provide due facilities to the farmers in the state. There is no question of the BJP entering into an alliance with the INLD in Haryana. The party is also against joining hands with the HVP. However, if the HVP leadership agrees, it may be merged with the BJP. The Haryana Vikas Party (HVP) supremo, Mr Bansi Lal, will hold workers’ meetings in all district towns of Haryana in October, the party general secretary, Mr Surinder Singh, said here today. The move of the Haryana Urban Development Authority (HUDA) to remove a green belt in Gurgaon to make way for service roads has upset residents of the city. The on-going power crisis in the state has come as a big blow to the industry. Various industrial organisations have claimed that they have lost 30 per cent of the total Rs 3500 crore annual revenue, because of non-availability of power during this year. The Haryana Government has issued transfer and posting orders of three IAS officers with immediate effect. Mr P.C.Bidhan, Joint Secretary, PW (B&R) and Architecture Department, has been posted as Director, Urban Development, relieving Mr Alok Nigam of the charge. The Haryana Cabinet, which met here today under the chairmanship of Chief Minister, Om Prakash Chautala, decided that the next session of the Haryana Vidhan Sabha would be summoned on September 29. A newly married woman, Kavita, succumbed to her injuries at Panipat Civil Hospital without any treatment after struggling for life for about half an hour. She was brought there after her accident on Asandh Road near Tau Devi Lal Thermal Power Station this morning. In yet another case of police high-handedness, a constable allegedly slapped a labourer of Ashok Vihar Colony and an ASI reportedly threatened some labourers of the same locality, injured in an attack, with dire consequences if they tried to lodge a complaint against the attackers. Partial bandh was observed at Charkhi Dadri, 29 km from here, in protest against the assault on a trader’s family and non-arrest of the accused today. Members of the District Bar Association abstained from court work yesterday in protect against the murder of the aged parents of Mr Bashruddin, Judicial Magistrate, Rewari. With at least three children getting drowned in water reservoirs here in the last three months, the PWD tanks have virtually become death traps. Unguarded water tanks in the township mark the security lapses on the part of the authorities. 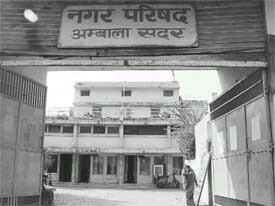 Ambala: The building of the Municipal Council, Ambala Sadar, housed The Tribune office soon after Partition. After The Tribune office shifted to Chandigarh in the 60s, the Municipal Council of Ambala Sadar occupied the building. The building used to be the residence of a well-to-do Muslim family during the British period. The Haryana unit of the Panun Kashmir, today observed Balidan Divas. The state secretary, Mr J.L. Koul, said that Kashmiri migrants observed this day in the memory of those who laid down their lives for the unity of the country. He said this year, it had been observed at Banke Bihari Mandir. Dr Raj Singh Dhanker today took over as the new Vice-Chancellor of Maharshi Dayanand University. After assuming charge he visited the university offices and later held a meeting with senior officials, including the Registrar and the Controller of Examinations. As per the directions of the Election Commission of India, special summary revision of electoral rolls of all the 90 Assembly constituencies in Haryana will be done with reference to January 1, 2005, as the qualifying date. Rajinder Singh, sarpanch of Salimsar Majra village, has been shot dead by some unidentified persons, late last night. On the statement of his brother, the Mohana police has registered a case. Leaders of the Congress, the main Opposition party in the state, had described Mr Chautala's visit as a political gimmick to garner votes in the election year. Mr Chautala, who returned from a three-day tour to Pakistan yesterday, brought sacred water form Sodhra village in Gujaranwala district, the birthplace of Bhai Kanhaiya, considered to be an apostle of peace in the Sikh history. Addressing a press conference here, Mr Chautala also termed as ridiculous allegation levelled by a former Haryana Congress president, Mr Bhupinder Singh Hooda, that the inclusion of Mr Sukhbir Singh Badal, son of Mr Prakash Singh Badal, President of the Shiromani Akali Dal, in Mr Chautala's 42-member delegation to Pakistan, proved that the INLD and Akali leaders were hand in glove with each other in denying the river waters to Haryana. Mr Chautala said his close family relations with the Badal family would not stand in the way of his commitment to uphold the interests of Haryana. He said even if his father told him to make a compromise on Haryana's interests, he would not listen to him. He said in that manner the Opposition could criticise him even for visiting the house of Sir Chhotu Ram, a highly respected pre-partition leader of joint Punjab, on the ground that he was a leader of the Unionist party, which was opposed to the Congress at that time. He said he would write to the External Affairs Minister, Mr Natwar Singh, to relax visa regime for those who were born in India or Pakistan before the partition so that they could visit their ancestral places. He said many old persons in Pakistan urged him to make arrangements for their visit to their ancestral places. They told him that it was a wish they wanted to be fulfilled before their death. Mr Chautala said improved relations between the two countries should pave the way for better trade ties between them. Improved relations, he said, would also lead to decrease in defence expenditure of the two countries. He called for relaxation in visa rules for those born in the pre-partition days so that such people from both India and Pakistan could visit their relatives and friends living across the border. Mr Chautala, who visited several villages of six districts of Punjab province in Pakistan, said the people of the neighbouring country sincerely wanted better bilateral ties. Answering a question he ruled out re-auction the controversial land for a commercial tower in Gurgaon in the wake allegations of irregularities and underpricing. Denying the allegation of a "multi-crore scam" in the auctions, as claimed by Mr Randeep Singh Surjewala, President of the Youth Congress; and Mr Karan Singh Dalal, Congress MLA, Mr Chautala said the auctions had been conducted in a "transparent, fair and impartial manner". Referring to reports that the Governor had sought a report from the Government in this regard, he said it was the Governor's constitutional right. Asserting that his government was committed to all-round development of the state, he said : "Haryana has not taken overdraft even for a day, despite spending so much on developmental projects." Referring to the deportation of the Resident Editor of the Chandigarh edition of Hindustan Times, Mr Kanwar Sandhu, by Pakistani officials, Mr Chautala said he would not only write to the Ministry of External Affairs but would also meet the External Affairs Minister, Mr Natwar Singh, and the Prime Minister, Mr Manmohan Singh, to inquire into the circumstances under which the incident happened, particularly as it came soon after the Foreign Ministers of the two countries agreed to ease visa restrictions for journalists. Mr Sandhu had gone to Pakistan as a member of the Chautala-led delegation, but was sent back from Lahore within hours of his reaching there. "It was not humiliation of the press or Mr Sandhu. I consider it as my personal humiliation and will take up the issue with the concerned authorities," he added. According to informed sources, Gujarat sought Mr Chautala’s help when a two-member delegation of a technical committee set up by the empowered committee on VAT set up by the Centre met Mr Chautala here today. One of the members of the technical committee, Mr M.M. Joshi, Additional Finance Secretary, Gujarat, reportedly told Mr Chautala that he should take a lead in opposing the abolition of the CST. The CST is to be abolished in four years after the introduction of VAT in the country. The sources say Haryana, Gujarat, Tamil Nadu, Maharashtra and Karnataka get about Rs 1000 crore each as CST per annum. If this tax is abolished these states stand to lose heavily, though the Centre is committed to compensate these states to the tune of 50 per cent of their loss in the first few years. However, these states do not want the CST to be abolished. While it is much easier to collect this tax as compared to sales tax, the chances of its evasion are also negligible because it is imposed mainly on multinational companies or big industries. Mr Joshi is here as a member of the advance party of the seven-member technical committee, which will visit Haryana for three days to study the implementation of VAT in the state. Haryana is the only state which has implemented VAT so far. The sources say Mr Joshi felt that Mr Chautala alone was competent to lead a joint struggle against the abolition of CST since Maharashtra and Karanatak were Congress-ruled states. The chairman of the technical committee is Mr Ramesh Chander, secretary of the empowered committee. He is a former Finance Secretary of the Union Territory of Delhi. The other members of the committee are Mr C.M. Bachhawat, Sales Tax Commissioner, West Bengal; Mr M.V. Rajaraman, former Finance Secretary, Tamil Nadu; Ms Renuka Vishwanathan, Adviser, Planning Commission; Dr Govind Rao, Director of the National Institute of Public Expenditure and Finance(NIPEF); and Ms Kavita Rao, an economist with the NIPEF. Addressing a public meeting at Thol village near here today, Mr Hooda described the Chautala government as anti-farmer. Mr Hooda alleged that Mr Om Prakash Chautala had not fulfilled his promises made to the farmers at the time of elections. The Congress leader alleged that the Chautala government had enhanced the rates of power and water several times in the past hitting the farmer. On the Sutlej-Yamuna Link (SYL) canal issue he said that Mr Chautala had politicised it. This was stated by the state spokesperson for the BJP, Dr Sarvadanand Arya, while addressing a press conference here today. The BJP spokesperson said the party would organise a rally at Rohtak on October 12. Former Prime Minister Atal Bihari Vajpayee, former Deputy Prime Minister L.K. Advani, BJP President Venkaiah Naidu, party leaders Ms Uma Bharti, Ms Vasundhara Raje and Mr Sahib Singh Verma, would address the rally, he added. Addressing a meeting of the state executive of the party he said the meetings would be a part of the HVP’s statewide mass contact drive in preparation of the forthcoming Assembly polls. He said the paucity of water and power, the SYL canal issue, rampant corruption, rising crime and unemployment would be his party’s main poll planks. Criticising the Chief Minister’s visit to Pakistan he said it was a “political stunt” aimed at befooling the masses would in no way help Haryana get the SYL canal completed. The HVP leader said the last five years had been the worst in the history of the state during which all it saw was a downhill slide in every sphere. He said it was because of this that the INLD had suffered a resounding defeat in the Lok Sabha polls. He was critical of the Congress and said that it began meaningless political campaigns only when the Assembly polls were on the anvil. On the SYL issue too the party had not done anything substantial to get the project completed. The move of the Haryana Urban Development Authority (HUDA) to remove a green belt in Gurgaon to make way for service roads has upset residents of the city. Residents allege that HUDA has decided to construct two four-lane service roads along the either side of the Mehrauli-Gurgaon road, popularly known as “MG Road”, ostensibly to decongest the main arterial road of the city, on which a large number of shopping malls have come up. In the last two years so many shopping malls have come up along MG Road that the area has been unofficially christened as the “Mall Mile”. Residents say that while these malls are being projected as “shopping paradise” and “mega-entertainment centers”, they have lost their peace and tranquillity. Loud music is played day and night. Generator sets installed by the malls and visiting vehicles have created a pollution problem for the residents, who have to also cope up with the increasing traffic because of the malls. Residents of the Beverly Park (II) say if HUDA went ahead with the construction of the service roads by removing the green belt on the either side of MG Road, the area would lose its “lungs”. They say HUDA decision is a contravention of the zoning and master plan of the area. They say the traffic jams over weekends and holidays is due to poor traffic management and also because a major portion of the roads is illegally occupied by hawkers, cycle-rickshaws and unauthorised taxis. Double and tripple parked vehicles by visitors to the malls add to the woes of the residents. The residents say the authorities should remove the encroachers from the pavements so that pedestrians are able to walk on them instead of the road. They should also construct a number of pedestrian over-bridges so that the pedestrians are not forced to cross the road. They admit that the authorities do tow away illegally parked vehicles but this needs to be done more vigorously. Once the encroachments by hawkers, trolleys, rickshaws and taxis are removed, the flow of traffic would become automatically smooth. Otherwise, on weekends it takes about 30 minutes to negotiate 500 metres in front of the malls. They point out that the green belt, an integral part of the master plan approved by HUDA, is vital for the health and wellbeing of the residents of the area, because it not only insulates the adjacent buildings from air and noise pollution, but it is also necessary for the recharging of ground water. Its removal will disturb the ecological balance of the area and will run against the letter and spirit of the anti-pollution laws. Thousands of trees and plants will be felled. Grass cover will be turned into tar and cement. They are also apprehensive that once the green belt is removed, the menace of hawkers will move closer to the residential buildings. The residents say they shifted from Delhi to Gurgaon to escape the polluted environs and traffic congestion in the national capital. In the process they invested their hard-earned money because the Haryana Government had promised them a pollution-free environment in Gurgaon, and not a “treeless concrete jungle”. The Haryana Power Utilities had ordered all industrial units in the state having load of 1 MW and above to close its operations on September 7, for a period of 15 days. Other than this, the industrial units in Haryana are dealing with light load restrictions for 11 hours — from 7 pm to 6 am — daily. Even during the day time, the power supply is erratic and frequent trippings are causing huge losses to the industry. This is the second time that severe power restrictions have been imposed on the industrial sector in the state. Earlier, on July 25 , the Power Utilities had ordered similar power restrictions to tide over the shortage of power. Industrialists say that the restrictions imposed now will prove to be the death-knell for the industry, and thousands of industrial workers, who are losing out on their salaries. Mr P.K. Jain, former President of the PHD Chamber of Commerce and Industry, New Delhi, informed TNS that the power is available to the industry for just 42 hours, of a total of 148 hours in a week. “The actual power available to the industrial units, even in the industrial hubs of Gurgaon and Faridabad, is about seven hours a day. Though most units having a load of over 1 MW have their own captive power generation system, but the industry cannot survive till the power supply is lost. The industrial labour in Gurgaon and Faridabad is without work, and labour unrest is brewing,” he says. Mr C.B. Goel from the Haryana Chamber of Commerce and Industry, says that if the power restrictions on the industry having a load of 1 MW and above are not removed, it will have a cascading effect on the smaller industrial units in the state. “If the Haryana Power Utilities fails to arrange for alternate power supply to the industry, the industrial production will come to a standstill,” he adds. Officials in the Haryana Power Utilities say that they have received representations from various industrial units and proposal to lift some restrictions is being considered. “We propose to allow the units having a load of 1 MW and above to begin operations on the condition that they have two compulsory off days than one. The light load restrictions for 11 hours will, however, be imposed on these industrial units,” informs a senior official. Mr Ashok Khemka, Joint Secretary and Director, Electronics and Information Technology, has been posted as Director and Joint Secretary, Secondary Education vice Mr D Suresh, who has been posted as Joint Secretary, PW (B&R) and Architecture Department. The government has also transferred Mr Balbir Singh, DSP, CID and has posted him as DSP, Jhajjar, against a vacant post. The cabinet also decided to rename the Non-Conventional Energy Sources Department as Renewable Energy Department. The Council of Ministers had in its last meeting held on September 7, renamed Haryana State Energy Development Agency as Haryana Renewable Energy Development Agency. While her husband, Jasbir of Kalawa village in Jind district, was brought dead, she was still struggling for life when she was brought to the hospital. However she was allegedly not given any type of treatment while she kept on struggling for her life for about 30 minutes. Kavita and Jasbir were married just a year before and were coming to Panipat on a motor cycle from Kalawa village for some work. However, some unidentified vehicle hit the motor cycle on their way to Panipat on Asandh Road. In yet another case of neglectful attitude of medical staff at Panipat Civil Hospital, injured Charan Singh and his wife, Poonam, of Hari Singh Colony were not given any type of treatment for one and a half hour. Both of them received injuries when they were allegedly attacked by their landlords. Charan Singh had received injuries on his head, arm and leg. Charan Singh and Poonam reached the Civil Hospital at around 11 a.m. but they were not attended till 12.30 p.m. Following which, they went to Civil Surgeon Neha Lata’s office in the same condition to tell her position. Talking to The Tribune, Charan Singh alleged that a bribe of Rs 500 was demanded from him by the paramedical staff for their treatment. He said that even the Civil Surgeon did not hear him properly. Later neither Dr Neha Lata nor Medical Superintendent H.S. Randhawa was available for comments on the two cases of neglectful attitude of medical staff of the hospital. According to Bhisam, constable Samundra Singh of the Qila police post, which falls under the Panipat city police station, slapped and abused him yesterday. He said Pali of the same locality was threatening him as he had helped some labourers including Sanjay, of the same locality against Pali on certain issues. At this, he called up the Qila police. Subsequently, constable Samundra Singh came to the locality. However, instead of taking action against Pali, he slapped him at the behest of Krishna Devi, who is close to ASI Satya Narayan of the Model Town police station. Bhisam said he again tried to lodge a complaint against Pali and the constable, but he was not even properly heard. He alleged that Sanjay was attacked by Krishna Devi, Sunny, Mukesh, Sonu, Kashmira and Happy with lathis and sharp-edged weapons yesterday. Sanjay’s mother Kanta Devi and father Budh Sen were also injured in the attack. Kanta Devi received serious injuries and was admitted to the Civil Hospital. When they went to lodge a complaint in this regard at the Qila police post, they were threatened with dire consequences. Bhisam and Sanjay said ASI Satya Narayan Singh reached the Civil Hospital on Monday night and threatened to eliminate Sanjay and his father Budh Sen to eliminate if they did not leave the colony. The ASI also went to Sanjay’s house and repeated the threat. Meanwhile, the district secretary of the CPI (ML) New Democracy, Mr P.P. Kapoor, alleged that the ASI was taking the side of the attackers as one of the attackers, Krishna Devi, was his paramour. DSP O.P. Narwal said ASI Satya Narayan and constable Samundra Singh had been sent to the Police Lines following the submission of a memorandum by the CPI (ML) New Democracy in this regard. A group of men armed with canes and lathis attacked the owners of Davra Fancy Emporium, located at the old bus stand road, in the evening. Few members of this group had reportedly come to the shop two days prior to the incident and had demanded a ransom which was turned down. Mohan (22) and Sunil (20) sons of owner Duli Chand Dawra sustained head injuries and they were admitted to the Civil Hospital. After the incident the miscreants escaped in a jeep. Later, traders of the town gathered and staged a demonstration under the banner of Beopar mandal. They had threatened to observe a bandh on Tuesday if the police failed to make arrests. Traders of the old bus stand, Lajpat Rai chowk and the railway road observed complete bandh. The police has registered a case in this connection. Mr Bashruddin’s father and mother were killed with sharpedged weapons by unidentified assailants at their residence in Shikarwa village in the Mewat region on Saturday night, Mr Fakhruddin, another son of the deceased, is also a judge and is posted at Rohtak. Members of the Bar, along with judges of Rewari district, also held a condolence meeting in which a resolution condemning the gruesome double murder and demanding arrest of the killers was adopted . They also observed a two-minute silence praying for peace to the departed souls. Later members of the Bar association as well as the judges went to Shikarwa village where they consoled members of the bereaved family. The township has two water reservoirs under the PWD at Chhatargarh and on the Barwala road. Only last week a 13-year-old boy was drowned in Chhatargarh while he was moving around the water tank along with his fiends. Similarly, last month a son of a labourer drowned in the other tank. Sources in the PWD said there was hardly anyone to man the water reservoirs and to keep away the trespassers. Most of the township gets water supply from these tanks and the authorities do not rule out the chances of any "mischief" by miscreants in the open and unmanned reservoirs. The sources stressed upon the need to deploy on round-the-clock security staff to avoid any accident in the future. When contacted, the Executive Engineer, Mr V.S. Dagar, said “Though the incidents are highly unfortunate but one should not step in the prohibited areas. Mr Dagar accepted that it was not possible to keep security guards as the water tanks were huge and had spread in acres. Mr Rulia Ram Sharma (95), retired General Manager of The Tribune, recalled that they occupied the building in Punjabi Mohalla, which was allotted to them after Partition. "We were facing a very difficult situation but we continued to print The Tribune. The building of the Municipal Council, Ambala Sadar, was our workplace," he said. Mr Sharma, who had joined The Tribune in Lahore in 1936, said that at the time of Partition they had to leave Lahore in a hurry. "The then News Editor A.C. Bali, who had considerable influence, arranged for a truck and two constables. About 80 Tribune employees managed to come to India in the truck," he said. He said that they reached Jalandhar in the morning of August 16, 1947. "We were forced to leave everything at Lahore. After reaching Jalandhar, we assembled the Tribune employees and tried to restart the publication. But we were unable to find a proper printing press, which would meet our requirement," he said. Mr Sharma, who retired after 45 years of service with The Tribune, said that in the month of September 1947they learnt that a suitable press was available at Shimla. "Liddle Press in Shimla, which was owned by an Englishman, met some of our requirements. Through the then Chief Minister Gopi Chand Bhargava we got the press for printing The Tribune and Bantony Place near Telegraph office for lodging," he said. "Distributing the newspaper was a challenge since there were no effective means of transport. We acquired two vehicles and they used to carry the newspaper to Ambala, which was the designated circulation point. From Ambala, the newspaper used to be forwarded to different areas in the region," he said. Mr Sharma said that during that period it was decided that The Tribune would be shifted out of Shimla. "We had two choices. One was Jalandhar and the other was Ambala. Vernacular newspapers, particularly Urdu papers, had made Jalandhar their base. However, Ambala was selected for shifting the newspaper office",he said. He said that Ambala was centrally located and in any case it was already being used as the distribution point. "After shifting to Ambala in 1948, we were allocated the building where the Municipal Council, Ambala Sadar, is currently lodged. We were facing difficulty in printing," he said. "Before Partition, we had placed an order for a Rotary press to a firm in the USA. Since we had moved out of Lahore we communicated with them and the shipment was sent to Delhi instead of Lahore. Following the arrival of suitable printing equipment, The Tribune began to be printed without any hiccups," he said. Mr R.R. Sharma said that when Chandigarh was built, a decision was taken to shift The Tribune to the new city. "Chandigarh was going to be the Capital of Punjab so The Tribune was shifted there," he said. Mr Koul demanded safe and honourable return of Kashmiri displaced persons. He said that some families had been recommended for cash relief yet they were waiting for payment. He requested the state government to release the payment without any delay. He sought allotment of land to deserving migrants at cheaper rates and providing jobs to one person in a family. CHANDIGARH: Tributes were paid to Kashmiri Pandits at a function here on Tuesday. According to a press note, thousands of Kashmiri Pandits have been languishing in camps in a state of penury. Over 10,000 youths have been moving from pillar to post in search of employment. It was on September 14, 1989, that their leader Tikka Pal Taploo was gunned down by terrorists outside his house in Srinagar. The killing had triggered off an exodus from the valley and since then the day is celebrated as “Kashmiri Pandits’ martyrs day”. Addressing them, he hoped that the entire university community would work hard for developing the university into a centre of academic excellence. Dr Dhanker said proper use of facilities and promotion of talent would certainly help create a congenial atmosphere for achieving academic excellence. He has replaced Major-Gen Bhim Singh Suhag (retd) who quit in April last to contest the Rohtak Lok Sabha election as the nominee of the Indian national Lok Dal. Before joining as VC, Dr Dhanker was Director, Centre for Canadian Studies at Delhi. Rajinder had gone to his fields late last night. Some villagers heard gun shots. However, in the morning sarpanch’s body was found in the fields, and the police was informed about it. Though the family members of the victim have not named any one behind the incident. The enmity on account of anti-encroachment drive in the village is suspected to be the cause of the murder. The police has arrested Popat, Rajesh and Ramesh, all residents of Ahmedabad (Gujarat) , on the charge of selling fake ghee here. The police also seized over one quintal of adulterated ghee from them. A case of cheating and adulteration under Sections 420 and 272 of the IPC has been registered against them. They had been living in a slum in the Qutabpur locality here.